Idaho Chicken Ranch: Sister's Fall Visit! My sweet sister came to visit over the weekend! We had such fun, tho we didn't do a whole lot of note. 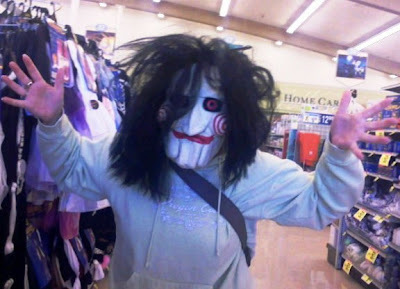 We did go to Rite Aid tho. And we did paw through the items in our Halloween costume bin. We went to Miracle Hot Springs about two hours southeast of Boise. It was awesome! Plus...GATORS!!! I've seen tons of gators in Florida and Louisiana, but we think sister had never seen a gator outside of a zoo. They weren't very social on Saturday. And we had a lot of creative time. 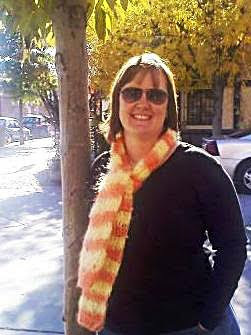 Sister just whipped up this awesome candy corn scarf for me! She's so talented. She was happy with her fall visit...not too busy, not too cold, not too hot. Auntie Poo is Here! Auntie Poo is Here!! An Impromptu Visit to Portland!